Zane Benefits, the online alternative to group health insurance, announced today the publication of a free eBook "A Small Business Owner's Guide to Section 105 Medical Reimbursement Plans." 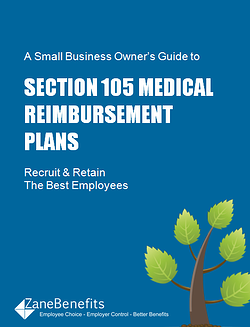 The new eBook helps small business owners recruit and retain employees using a Section 105 Medical Reimbursement Plan. Offering employees health insurance is vital to recruiting and retaining key employees. This is especially true for small businesses. And yet, less than 50% of small businesses offer health insurance due to cost or minimum participation requirements... and because they don't know an alternative small business health insurance option exists. Section 105 Medical Reimbursement Plans (also known as Health Reimbursement Arrangements) provide small businesses a new tool to offer tax-free health benefits without the cost or complication of group health insurance. The new guide provides small business owners an executive-level overview to Section 105 Medical Reimbursement Plans.